DID YOU KNOW THAT... In the world there are 17 million people with Cerebral Palsy Infantile? Every hour a child with Infantile Cerebral Palsy (also called PCI or CP) is born in the world, Cerebral Palsy in English). It Is the most common physical disability in childhood. Cerebral Palsy is a generic term that groups together a set of disorders. It Is a permanent condition, but not immutable. Cerebral Palsy is a permanent physical disability due to damage to the developing brain. In most cases, a cerebral lesion occurs during pregnancy and then leads to Cerebral Palsy. Cerebral Palsy, except in its milder forms, may be evident in the first 12-18 months but a more specific diagnosis usually occurs within the 3-4 years of life. Motor disability can be minimal or very disabling, depending on the individual. Motor disability can be represented by a weaker hand up to an almost complete lack of voluntary movement and therefore requires continuous assistance. It Is likely that children with Cerebral Palsy may develop other comorbidities, in addition to their motor disability. Spastic hemiplegia, where one half of the body has difficulty with voluntary movement, is the most common type of Infantile Cerebral Palsy (over 40% of individuals with PCI). There is now No known cure for Infantile Cerebral Palsy. 1 Child out of 2 with Cerebral Palsy also suffers from chronic pain. 1 Child out of 2 with Cerebral Palsy also has a cognitive deficit. 1 Child out of 3 with Cerebral Palsy cannot walk. 1 Child out of 4 with Cerebral Palsy has epilepsy. 1 out of 4 child with Cerebral Palsy has a behavioral disorder. 1 Child out of 5 with Cerebral Palsy cannot speak. 1 Child out of 5 with Cerebral Palsy has a sleep disorder. 1 out of 10 child with Cerebral Palsy has a severe vision impairment. 1 out of 25 child with Cerebral Palsy has a severe auditory deficit. Of all children with Cerebral Palsy, 40% was born prematurely and 60% was born in the end. It often Happens to talk with friends who have no awareness of disability linked to Infantile Cerebral Palsy, the name itself inspires fear and refers to a situation without escape or something far from the experience of life of many: yet it is not about Something rare, if not of little known, but which It impacts the lives of 17 million people and their family members all over the world. is the most common physical disability in childhood. Discover here and share with your friends this information that everyone should know about Infantile Cerebral Palsy. The term Cerebral Palsy refers to a group of non-progressive disorders affecting movement, balance and posture. The condition stems from something anomalous happened to the developing brain or from brain damage before birth, during birth or within the first three years of life (and that is why it is called Infantile). In Cerebral Palsy, signals from the brain to the body are lost or redirected, resulting in difficulties for people with Cerebral Palsy. Cerebral Palsy manifests itself in a variety of ways. The three main types of Cerebral Palsy are Spastic Cerebral Palsy (the most common, characterized by muscular stiffness in at least one limb), Atetoid Cerebral Palsy (characterized by involuntary movement) and Ataxic Cerebral Palsy ( Characterized by difficulties for the coordinated movement). However, the limits between one classification and the other are not so clear and there may be mixed forms of Infantile Cerebral Palsy, or other categorization (e.g. subdivision into spastic Cerebral Palsy, discinetic, ataxic, hypotonic or mixed). There is also a further classification concerning the limbs affected by Cerebral Palsy: For example, spastic Cerebral Palsy can mainly or exclusively affect the legs (spastic diplegia), one side of the body (spastic hemiplegia) or May Affecting all four limbs (spastic tetraplegia). In rare cases, spastic Cerebral Palsy may affect a limb (spastic monoplegia) or three limbs (spastic triplegia). Some forms are therefore more evident in the eyes of all while others are among the &apos; invisible &apos; disabilities, or about 70% of all the disabilities that we know, which affect concretely on a person&apos;s life but may not be so obvious if Look from the outside. 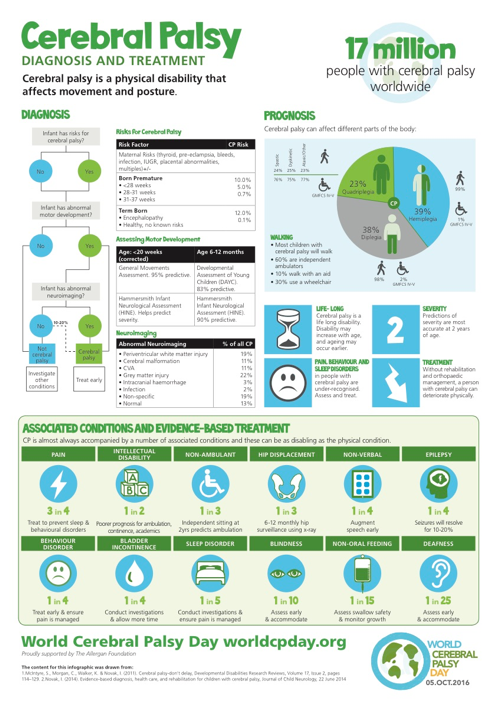 Cerebral Palsy has a wide range of severity. Some people with Cerebral Palsy may not be blatantly disabled or may seem slightly untidy, while others have very limited control of their bodily movements and may have other neurological symptoms, such as eyesight problems or Hearing, convulsions, intellectual disability or difficulty in speaking. Depending On the severity of their condition and their needs, people with Cerebral Palsy can use guardians, sticks, crutches, ambulators or wheelchairs to move, but not all need assistive mobility devices. A bit &apos; as happens to all human beings, some have blond hair, other brown or black, others even red: it pays attention to enhance and not discriminate the various differences. If for you to date Botox belonged only to the world of the celebrities of the show, know that the botulinum toxin is used in infinitesimal doses also to relieve the muscular rigidity in people with Cerebral Palsy. In Addition, many people with Cerebral Palsy undergo tendon elongations and other orthopedic procedures, such as serial casting, in order to maintain movement. Others develop comorbidities, such as epilepsy, and for this reason they always carry life-saving drugs with them. To improve daily life activities, those living with Cerebral Palsy can attend weekly physiotherapy and occupational therapy sessions, to better develop motor skills and increase independence, as well as Pure speech therapy sessions to improve communication skills and language. When you see a child with Cerebral Palsy periodically walking away from school, do not think he is lazy, more often attends an afternoon rehabilitation center. Although It has neurological origin, Cerebral Palsy is not part of intellectual disability, but may be present along with intellectual disability. Many people who live with Cerebral Palsy have average intelligence or above average-just as it happens in people without Cerebral Palsy. We therefore advise You, in the absence of other elements of judgement, to assume competence when interacting with people suffering from Cerebral Palsy. Cerebral Palsy can cause progressive muscle wear, particularly over time. The pain in people living with this disability for several years can result from abnormal movements of the muscles, typical of Cerebral Palsy. 3 out of 4 children and adolescents with Cerebral Palsy experience pain, percentage rising Up to 80% in adults with Cerebral Palsy experiencing physical pain. Often, those who live with a visible Cerebral Palsy disability receive personal questions in public &apos; What happened to you? &apos;, because they use special assistance devices or because they carry out certain tasks in a different way from others. Although some people with Cerebral Palsy are willing to respond to questions formulated in a polite manner, it is not their responsibility to educate others on this condition and have the right to refuse to answer intrusive questions: Share this rough information with your friends and help us create awareness, not stigma. From a young age, many people with Cerebral Palsy learn adaptive skills to maximize their adult independence. Although some people with Cerebral Palsy require high levels of assistance, many others can drive or move independently, live in an independent way and sustain themselves economically. For example, depending on the level of autonomy and the recognition of disability, some of them are not granted the right to accompanying allowances or attendance allowances: and in these cases, if they want to be independent adults, they work Really. Do you think you&apos;ve learned something more about people with Infantile Cerebral Palsy? Download From this manual All the necessary insights and contact us if you feel you need to add more relevant information to this informative document. Source: Thanks to the Cerebral Palsy Alliance https://cparf.org/ For making this information available.